In an earlier post, I talked about the Great Hamster of Alsace. These hamsters thrive in fields of wheat and alfalfa. Unfortunately for the hamsters, contemporary French farmers have switched to more profitable crops such as wine and corn. These crops do not provide the shelter for the hamsters and the population of these creatures is plummeting. In response, the French government is considering a policy to force farmers to return to the less lucrative uses of their land so that the hamsters will be protected. If you are thinking that such interventions seem to be growing, you would be correct. 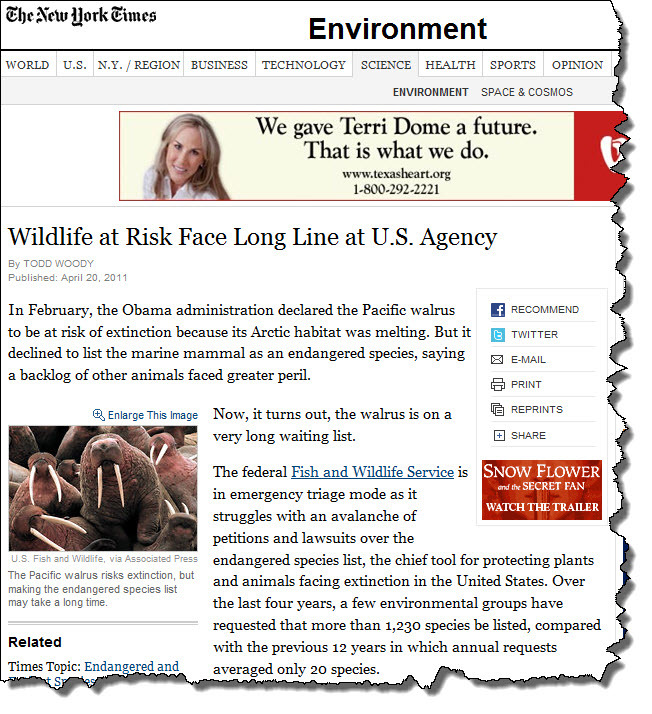 The Thursday April 21, 2011 edition of the New York Times carried the following story concerning U.S. experiences with endangered species. The Fish and Wildlife Service is so overwhelmed by the explosion in requests to add species to the endangered list that it has told Congress it has become paralyzed and unable to perform its tasks. 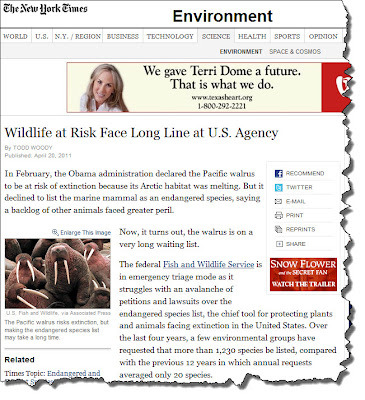 Adding to the mounting problem is a concurrent explosion in litigation against the Fish and Wildlife Service for missing multiple deadlines in each application, deadlines written into the Endangered Species Act passed in 1973. The groups filing these numerous requests for intervention are trying to be the voice for the unrepresented species. They ask for government intervention to restrict market outcomes, arguing that the socially optimal outcome demands incorporating the costs imposed on these species (how these “costs” are measured is a different and very complex issue). 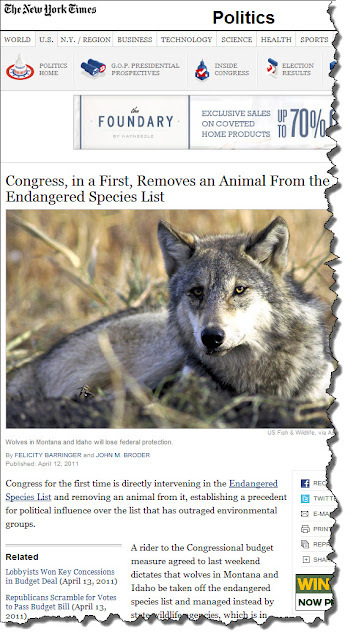 The April 13, 2011 issue of the New York Times ran a story about the recent efforts in Congress to remove a species from the endangered list. This is notable because it is the first time Congress has directly intervened on the endangered species list. Environmental groups are alarmed at this “political” intervention. But, as the amount of economic activity impacted by the endangered list grows, you can expect to see more and more such congressional scrutiny.